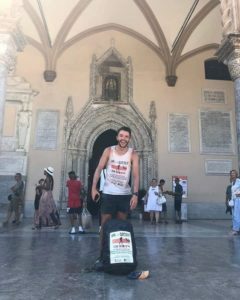 Ross Simpson, has now completed the most incredible challenge of running from Canterbury Cathedral to Palermo Cathedral in Sicily – 1,800 miles (3,000k)… That’s 71 marathons in 93 days! “On the 1st of May I embarked upon the most dangerous journey of my life. I ran through the gates of Canterbury Cathedral, bound for Palermo Cathedral, Sicily. To get there I’d have to run almost 3000km, or around 71 marathons in 93 days. My aim? To raise money and awareness for the brilliant and underfunded charity – Youth Cancer Trust. 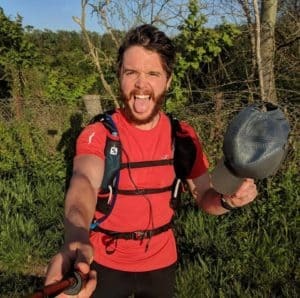 Carrying my tent, food and water with me in a rucksack I began my unsupported cross continent run. I ran to Dover and hopped on the ferry to Calais. From Calais I ran across France, I traced the rememberance trail and visited WW1 and WW2 graves of fallen British and Allied soldiers. I ran past bombed cathedrals and towns, still scarred by the the 20th century. I ran past Reims and into the Champagne region, past rolling vineyards for the likes of Tattinger and Veuve Cliquot. I ran through deserted towns where finding food and water was a real test. I ran up into the Jura mountains, past waterfalls and quaint hill top towns into Switzerland. From the border I ran to the edge of Lake Geneva and traced the edge heading for the snow capped Alps. I ascended the steep mountains. My path was covered in 20ft of snow, so I detoured along the closed road towards the Great St Bernard Pass. I didn’t see a single soul on the mountain, except for two french men that skiied past me and said the route was too dangerous. I was terrified the snow walls would fall and cover me. 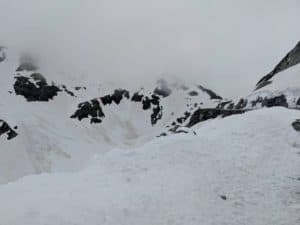 Finally reaching the top of the pass, I descended into Italy, climbing over and under Avalanche snow fall into the Aosta Valley. 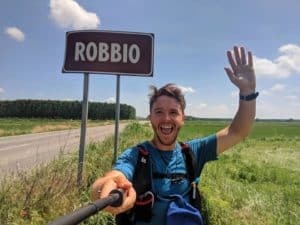 I was chased by bulls, pushed off my path by packs of dogs, ran past mountain fortress towns, and reached Vercelli and the beginning of the rice fields. I spent a week running through intense, still humidity, heat and a tyrade of mosquitoes. I got sick, and spent 2 weeks coughing and feeling run down each morning. From Fidenza I dropped into the Appenines mountain range. Most days I’d run over multiple peaks and the toll on my ill body was immense. I reached half way. The milestone I thought would be reassuring was now more daunting than anything, and I came to terms with doing the same again. My feet were blistered and the footwear I had couldn’t handle the loose, rocky terrain. I fell over countless times. Finally I reached the literal ‘door’ to Tuscany and later that day as I rounded a corner I felt my first breeze since the Aosta valley. I was given the keys to an ancient Castle in Pontremoli, and from there I ran down to the Mediterranean sea. I passed through coastlines and busy cities crammed with tourists. I ran to Lucca and then over the rolling Tuscan hills, past the patchwork fields and cypress trees to Sienna. I did a lap of the Piazza del Campo. I dealt with great loneliness as I saw those around me on holiday. My legs ached, my muscles and tendons were tight and I put my focus on the next milestone, Rome. 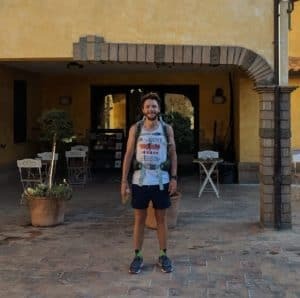 I ran down into Lazio, past mountain top castles and fortified towns, and the temperature increased drastically. I finally reached Rome, and I ran into the Vatican City. There I had planned to spend a few days sightseeing, but they quickly turned into bed rest as my body tried to heal itself. From Rome I ran down the ancient Appian Way and past lakeside mountain towns. I ran towards Naples and my route took to the roads more and started to become far more dangerous. The air pollution was a real issue, and the poorly maintained Italian roads left me with barely any space to run. I stopped in Naples, and then ran on past Pompeii and towards my 4th mountain range. 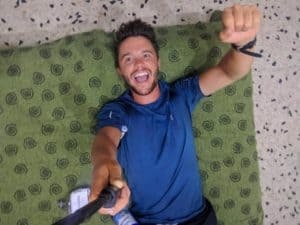 The weather became unbareably hot and the rise in my body temperature meant that my body couldn’t prioritise blood for digestion. I spent the mornings of most days throwing up and avoiding dangerous drivers. I camped in the mountains, my tent surrounded by a family of wild pigs. The piglets surrounded my tent and I had to shout and clap to scare off the aggressive mother. I continued the next day out of the mountains and down to the Northern coast of Calabria. The roads were littered with dead stray dogs and cats, and they acted as a constant reminder of the danger the roads posed to me. A couple of days later I saw first hand the danger of the roads as I was escorted by the fire service through a fatal car crash site. My days were filled with adrenaline. My feet and ankles began to swell as stress fractures formed in my overused bones. I continued on along steep winding coastal cliff roads and towards Villa San Giovanni where I’d take my short ferry to Messina, Sicily. I reached Sicily, my body now fully exhausted and the sun exposure and dehydration became a problem. I almost fainted more than a few times through lack of water. 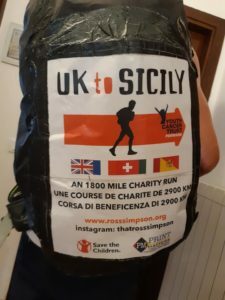 Finally on the 3rd of August, I reached Palermo Cathedral, Sicily and finished my journey. My body feels slightly broken, but I’m so relieved to be safe and have completed my trip. I kept my suffering in perspective, knowing that out there today teenagers and young adults are being diagnosed with cancer, parents are trying to put on a brave face for their children and someone has just lost the toughest battle of their short life. YCT offer short adventure breaks to young people diagnosed and living with varying stages of cancer. They give 14-30 year olds a chance to meet with others in a similar situation, to share their experiences, get support and reduce the sense of isolation often felt with a cancer diagnosis at such a critical age. Some of the young people are terminally ill, and visiting YCT can be a brief escape from hospitals and anxious parents, and a way to spend quality time with friends or siblings. Here is a short excerpt from Sania, a recipient of YCT’s brilliant work. Previous StoryNew Partnership with charity – ‘Something to Look Forward to’ Next StoryPurbeck Ice Cream’s Documentary featuring Youth Cancer Trust!